Middlepoint to Madeira Park has some great hiking and biking trails - and the nicest part is that it isn't too hilly (unless you do Cardiac Hill). This area is a bit of a sleeper as relatively speaking, not that many people know about the trails here. The Suncoaster trail comes down to the highway at Menacher Rd. and follows Hwy. 101 to McKay Rd. at Pender Harbour Secondary School. However, if you take Highway to Hell, AC/DC (aka AC Canyon)and follow the powerline road you can avoid the highway and meet up with the Suncoaster again above McKay Rd. Unfortunately, the reason this isn't officially part of the Suncoaster trail is that the bridge over Anderson Creek is not suitable for ATV's and the Suncoaster is supposed to be multi-use. Garden Bay through the mist on AC/DC. 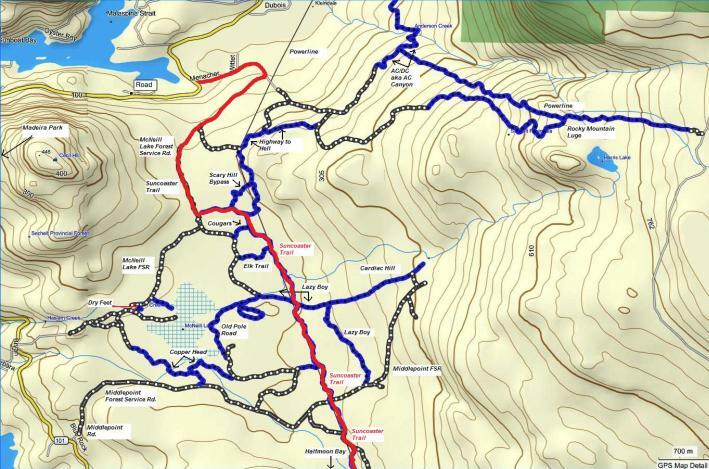 The Suncoaster trail is marked in red on the map below. Click here to open pdf version of this map with higher resolution. 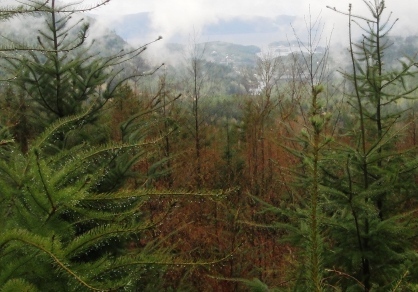 Click here to return from Middlepoint Madeira Park Trail Map to the Sunshine Coast Trails Home page.